Tracey Chambers created “upskilling and business launch hubs” in the three largest metro areas in South Africa—Johannesburg, Cape Town and Durban. Building on her initial idea of channeling excess amounts of retail stock to unemployed women in townships so they can start their own businesses, Tracey Chambers created “upskilling and business launch hubs” in the three largest metro areas in South Africa—Johannesburg, Cape Town and Durban. With a growing number of business models for unemployed women and men, she continues to expand the reach of her hub network in other cities. To realize her goal of empowering township residents to start their own businesses and lift themselves out of poverty, Tracey began by launching The Clothing Bank, which partners with South Africa’s top retail companies, who donate their excess stock to the Bank. The Bank sells this inventory at deeply discounted prices to women, who quickly start their own small business, while at the same time participating in extensive training. Tracey created a two-year training program to help build the confidence, sense of community, and skills women need to succeed. The training includes mentorship, life and peer-coaching, as well as business and technical skills development. Addressing critical areas of physical, mental, and social wellbeing, this “head-heart-hands” approach differentiates Tracey’s program from traditional business and entrepreneurship programs in South Africa. Tracey’s methods also offer a way for retailers to address the burgeoning problem of retail waste—merchandise such as customer returns, store damages, end of season excess inventory, and bulk rejections all typically end up in landfills. Building on her success with The Clothing Bank and seeing a need to further arrest the poverty cycle, Tracey used the same methodology to expand with The Appliance Bank, which focuses on excess consumer appliances and unemployed men. She also saw that quality child care was a barrier to success, so she built a network of sustainable centers that provide quality early childhood education by providing “business-in-a-box” support and training to early child care providers. 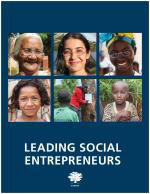 Tracey' s story appears in the 2018 edition of "Leading Social Entrepreneurs" which features a selection of just a few of the Ashoka Fellows recently brought into the largest global network of social entrepreneurs. The LSE presents some of the newest innovations by leading social entrepreneurs whose ideas are changing the way things are done all over the world.